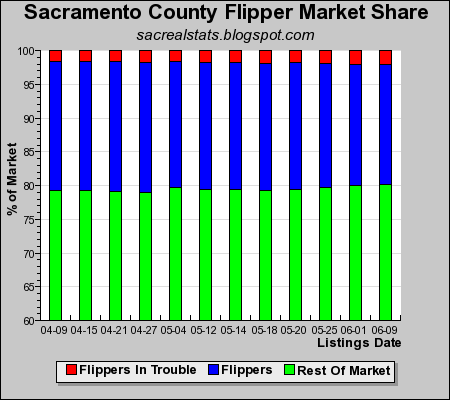 Here are the latest inventory and flipper trend graphs for the Sacramento region. 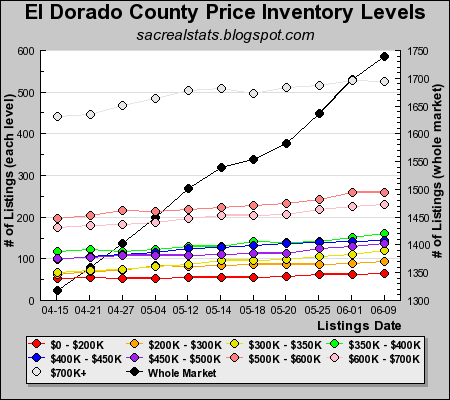 El Dorado County continued its gradual flipper reduction trend even as inventory built to 1,740. 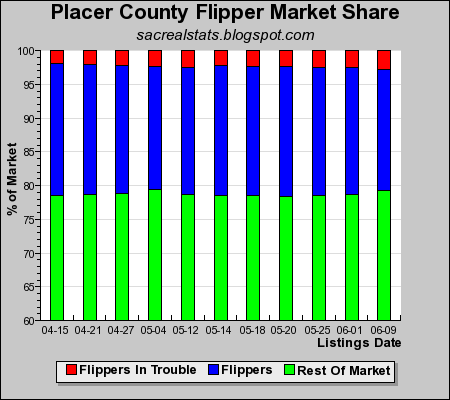 Placer County flippers, on the other hand, continued their poor showing with 91 flippers taking a loss. 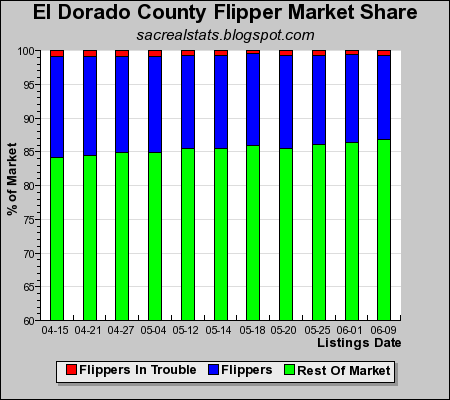 That is up from 80 loss takers last week, even though flipper inventory remained unchanged at 667 listings. 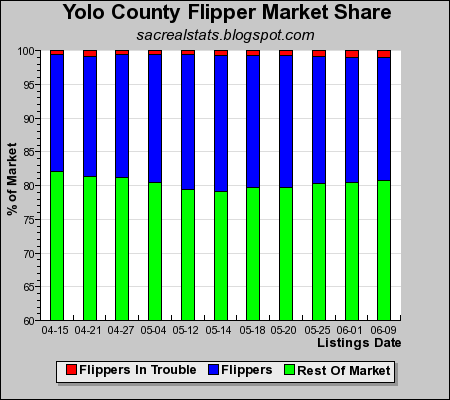 Sacramento and Yolo county flippers remained unchanged since last week, with flipper inventory in both counties showing increases in proportion with the rest of the market. 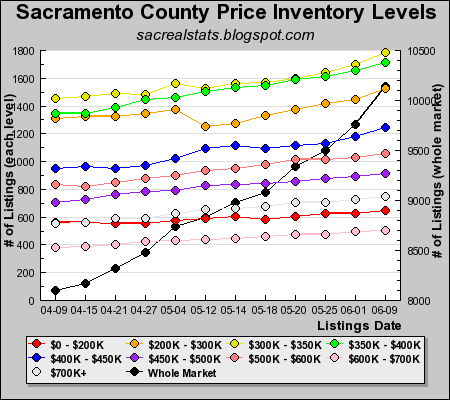 Pricing trends in all four counties of the Sacramento Region have remained consistent over the last 8 weeks, with one exception. 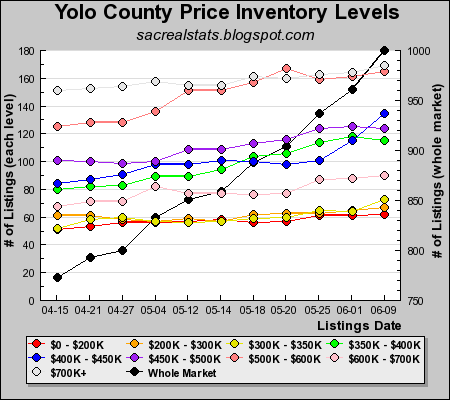 We are seeing a breakout in the $400K-$450K range in Yolo County, starting on May 25. There has been a 40% increase in inventory at this price range since that time. Interesting stats - how do you define a flipper and determine that they are in trouble? I define a flipper is someone who is reselling a house within two years of buying it. A "flipper in trouble" is a flipper who is selling a house for what they paid for it or less. I explain with more detail in this post. Thanks. It is a good first attempt to get an idea of the amount of speculation in the marketplace. I know the concept has limitations, but it's the only test I can run that allows me to compare the past to the present. The biggest hurdle to overcome is the lack of new home sales data. I’m in the process to gathering completion notice for new homes for Sac County, but the data is closely held. I suspect that a lot of the recent speculation has taken place in the new home arena. All in all, do you think that a 20% flipper market share is a big number? What is a “normal” amount of investor activity? Hard to say. 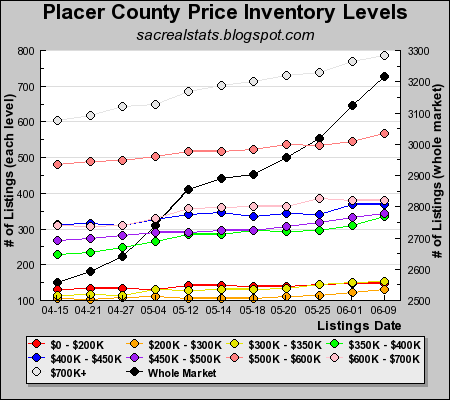 The census reports that there were 68,000 owner occupied homes (and condos, I presume) in 2000 in Placer County. Of those the head of household moved into just under 10,000 (14%) just before the census. Another 30% in the previous four years. But a number of these would be new homes. As I understand your stats, appx. 20% of homes currently for sale were purchased in the last two years. Off the top, that seems high given the transaction costs involved in buying and selling a home. However, I have a family member who has bought and sold 3 homes in five years, but due to changing circumstances (job, baby) and is not holding them as investments. PS I tried posting this info before but for some reason it did not show up. PS. I came across a site which quotes the national association of realtors as saying that 3% of home purchases are resold within one year.